Omega-3 Fish Oil - 16.9 oz. 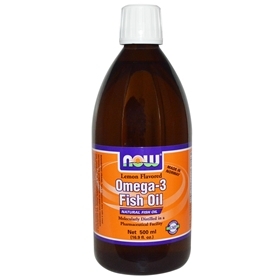 This natural fish oil is molecularly distilled and manufactured in Norway under strict quality control standards. It is tested to be free of potentially harmful levels of contaminants (i.e. mercury, heavy metals, PCB's, dioxins, and other contaminants). Those who experience nausea from other fish oil products should find this lemon flavored oil easier to tolerate. Omega-3 fatty acids are polyunsaturated fatty acids, including eicosapentaenic acid (EPA) and docosahexanoic acid (DHA), found in fish, and alpha-linolenic acid (ALA), which is found in plants. Unlike the saturated fats in foods like butter and meat, which can raise levels of unhealthy (LDL) cholesterol, polyunsaturated fats are healthier because they help lower cholesterol levels and reduce inflammation throughout the body. EPA and DHA are called essential fatty acids because the body doesn't produce them, and that is why it's important to get omega-3 fatty acids from food or from supplements. Omega-3 fatty acids protect your cardiovascular system in a number of ways. They help to lower levels of cholesterol that can build up in your arteries and form plaques that increase your risk for a heart attack or stroke. They reduce levels of unhealthy fats called triglycerides in the blood significantly. High levels of triglycerides have been linked to an increased risk for cardiovascular disease. They decrease the risk of abnormal heartbeats, or arrhythmias, which can lead to sudden death. Omega-3's help prevent blood clots from forming. Clots that break off and block a coronary artery to the heart can cause a heart attack. Clots that block the flow of blood to the brain can lead to a stroke, and can lower blood pressure, another risk factor. They reduce inflammation in the body, which helps prevent the blockage arteries from becoming blocked and prevent the re-narrowing of coronary arteries. Studies are finding that the omega-3 fatty acids found in fish are essential for brain health, The importance of these fatty acids becomes most obvious when they're lacking, as those who don't get enough omega-3s in their diet face an increased risk of developing brain conditions such as dementia, depression, attention-deficit disorder, dyslexia and schizophrenia. Research is finding that omega-3 fatty acids have several brain-boosting benefits. They improve learning and memory. In studies, children who received omega-3 fatty acid supplements did better in school, scored higher on tests of learning and memory, and had fewer behavioral problems than their peers who didn't get the supplement. Omega's protect against depression, other mood disorders, and schizophrenia, and improve mood in people who already have depression and fight age-related cognitive decline due to dementia. For families who want to have children, The benefits of omega-3s can begin before birth. DHA is passed to the fetus from the mother across the placenta, and it's found naturally in breast milk. Babies need DHA especially during the first two years of life for their brains to develop properly. One study found that babies who were born to mothers with higher blood levels of DHA scored higher on tests of attention and learning than those whose mothers had lower DHA levels. Another study found that children of mothers who took fish oil supplements during pregnancy had higher IQs than those whose mothers took a placebo. Your brain is mostly made up of water and fat (DHA), so it makes a lot of sence to drink a lot of water and take fish oil. One of the many benefits of omega-3 fatty acids is their ability to reduce inflammation throughout the body. Researchers have discovered that not only do omega-3s help fight inflammation, but that once inside the body, they're converted into even more potent anti-inflammatory compounds like resolvins. A few studies have found that taking fish oil supplements every day can reduce morning stiffness, and the number of swollen joints in patients with rheumatoid arthritis. Some patients who took omega-3 fatty acids were even able to reduce or stop the use of arthritis medications such as nonsteroidal anti-inflammatory drugs (NSAIDs) and corticosteroids. In the studies, participants needed to take omega-3 fatty acids for three months to see an improvement, but the benefits increased the longer people took them. Omega-3 is really important for healthy skin and hair. If you're experiencing dry, scaly skin, try taking fish oil. Omega-3 fatty acids- especially EPA- are essential for healthy skin and hair. EPA helps regulate oil production in your skin, so having plenty of this essential fatty acid in your body keeps your skin hydrated and prevents it from drying and flaking. Because of their anti-inflammatory properties, omega-3s can also help relieve skin conditions like rosacea, psoriasis, and eczema. Omega-3s are even good for the skin on top of your head. Without enough of these nutrients, your scalp can start to get dry and flaky, and your hair can lose its luster. And don't forget about your pets- you can also use it on your dog or cat. Omega-3s are often given to pets to improve the health of their skin and coat. Omega-3 is an essential fatty acid, and that means we can not make it, but need to consume it to be healthy. Dr Dean Ornish has said that it is the single most important thing you can do for your health, and most everyone including Dr OZ highly recommend it. Suggested Usage: As a dietary supplement, take 1 teaspoonful one or more times daily with meals. Consider taking this product in combination with NOW® CoQ10 and Tru-E BioComplex™. Ingredients: Natural Omega-3 Fish Oil, Natural Lemon, Flavored and Natural Antioxidant Blend (proprietary blend of Rosemary Extract, Ascorbyl Palmitate and Natural Tocopherols). Contains fish (sardines, anachovies) and soy derivatives. Contains no: sugar, salt, starch, yeast, wheat, gluten, milk, egg or preservatives. Refrigerate after opening to maintain freshness. Consumption of Omega-3 fatty acids may reduced the risk of coronary heart disease. FDA evaluated the data and determined that, although there is scientific evidence supporting the claim, the evidence is not conclusive. **As the superior naturally-occurring triglyceride forms. Product of Norway. Manufactured in a Pharmaceutically licensed facility. What is Omega-3 and what is it good for? Omega-3 is an essential fatty acid (EFA), also known as a polyunsaturated fatty acid (PUFA). It is derived from both animal and plant sources, although Omega-3 from fish oil is the most common supplemental form. Fatty acids form the main useful fraction of fats and oils and are necessary for overall health. Because your body cannot manufacture essential fatty acids, you must get them from food or supplemental sources. Plant sources such as Flax Oil contain the parent Omega-3 fatty acid called Alpha-linolenic acid (ALA). The human body normally converts ALA to the longer chain fatty acids EPA and DHA, which are used for prostaglandin formation and other cellular needs. Fish Oil contains the desired Omega-3 fatty acids in their more useful EPA and DHA forms. ALA requires enzymatic conversion to generate EPA and DHA. What does: "Free of potentially harmful levels of mercury, heavy metal, PCBs, dioxins and other potentially harmful contaminants " mean? All fish contain contaminants due to either man-made pollution or natural impurities in seas and fresh water. As with all our natural products, we take care to ensure that they are tested for contaminants as necessary. All our fish oils have been evaluated for a variety of contaminants. Heavy metals and mercury are checked using a sophisticated instrument called ICP-MS. We have this instrument in-house and do these tests on a regular basis. Our standards are set to the AHPA standards, which are tighter than most other scientific based standards. We have a long historical record of PCB and dioxin testing for our fish oils. The most recognized world standard is the European Commission standard, which has been adopted by the US Pharmacopeia. This standard for PCBs, dioxins and other similar contaminants takes into account the toxicity of the different PCBs and dioxins. This standard is a true safety standard and we follow this guideline. You can learn more about PCBs in this article, PCBs, Fish and Fish Oil, by Rick Sharpee, Ph.D. We also test our fish oils for other contaminants such as bacteria and pathogens. Our fish oils are generally safer than eating fish because of the additional purification steps that take place. These steps may include absorbent technologies and molecular distillation, depending on the type of fish oil. Is your New Omega-3 Fish Oil softgel pharmaceutical grade? There is a lot of confusion caused by supplement distributors who claim to have a pharmaceutical grade Omega 3 Fish Oil. There is no such thing in the United States, as the official USP (United States Pharmacopeia) monograph that defines the testing specifications necessary to qualify Omega 3 Fish oils as pharmaceutical grade has never been published. Anyone claiming to have "pharmaceutical grade" fish oils is simply over-hyping their product by claiming to meet a non-existent standard. NOW does not claim this, as it is simply not possible. Why is your Omega-3 Fish Oil Molecularly Distilled? The Omega-3 Fish Oil used in these products are from fish caught in either Norway or Peru and are generally processed utilizing high vacuum Molecular Distillation. This processing technique guarantees the production of high purity EPA/DHA Omega-3 Fish Oils and minimizes the presence of impurities. What fish are used for producing the Omega-3 Fish Oil? Sardines, Anchovies and Mackerel are the primary species used in the production of our Omega-3 Fish Oils. The special enteric-coated softgels used to deliver Molecularly Distilled Omega 3 Fish Oil protect the contents of the capsule from stomach acid by preventing gastric juices from dissolving the softgel in the stomach. This allows people to enjoy the benefits of Omega 3 Fish Oil without having the fish oil taste "repeat". The enteric-coated softgel will then release the Omega 3 fish oil in the alkaline environment beyond the stomach. Are your Fish Oil products high in Vitamin A? Omega-3 fish oils are made from the whole bodies of fish such as sardines, anchovies, and mackerel, rather than from fish liver oil. Omega-3 fish oils are body oils that undergo purification to remove these vitamins and provide EPA and DHA. Fish Liver Oils (such as Cod Liver Oil) usually do contain vitamins A and D along with some EPA and DHA.